UiPath joins forces with Tech Mahindra to launch an inaugural conference dedicated to the Indian market. The event is designed to ignite a valuable conversation on how RPA combined with machine learning and other Artificial Intelligence (AI) capabilities will achieve transformative results for businesses. UiPath's leadership team will be there to answer your questions and clarify all the ins and outs of digital business disruption through RPA. 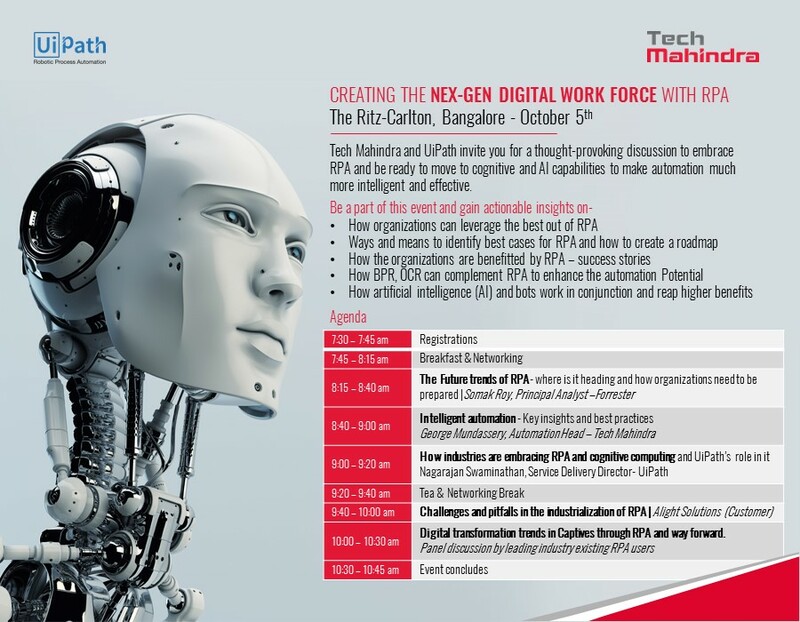 Nagarajan Swaminathan, Customer Success Director – India & APAC at UiPath, will focus on “How industries are embracing RPA and cognitive computing”. George Mundassery, Tech Mahindra’s Automation Head, will contribute with key insights and best practices on “Intelligent automation”. Principal Analyst at Forrester, Somak Roy will take you through “The future trends of RPA”. How RPA can incorporate AI and extend far beyond its initial scope. Finally, a panel discussion will allow speakers and attendees to debate “Digital transformation trends in Captives through RPA and way forward”.